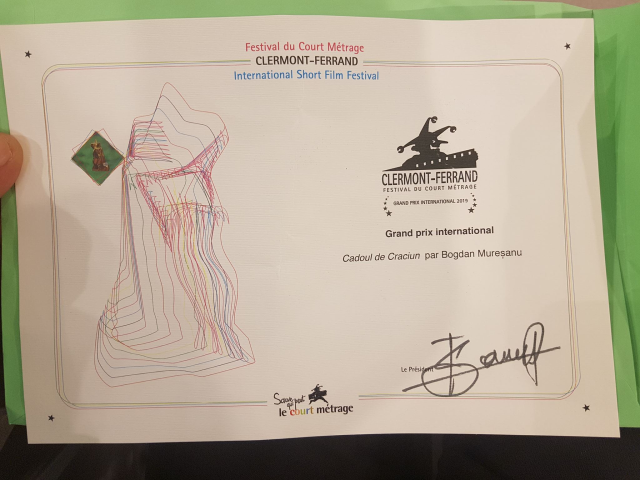 The short film “The Christmas Gift”, directed by Bogdan Muresanu, got the Grand Prize at the Clermont-Ferrand International Short Film Festival. The short film “The Christmas Gift”, directed by Bogdan Muresanu, got the Grand Prize at the Clermont-Ferrand International Short Film Festival. Since hitting the festival trail, Muresanu's film received numerous international prizes, among them the Romanian Film Days Award, at the Transylvania International Film Festival, the Grand Prize of the short film section of the Cottbus Film Festival, and an honorable mention at the Montpellier Festival. The plot is set in the evening of December 20, 1989. It starts with a letter to Santa Claus from a boy telling him what his parents want for the holidays. The boy's father realizes, to his horror that the wish in the letter that the boy put in the mail is to see Ceausescu dead. We talked to Bogdan Muresanu about the film, about his hopes tied to a revival of civil society, and the duty to talk about historic moments he has witnessed. Especially since one other short film of his, “Half Shaved”, tells a story set in the early 1990s, right after the regime change, when a barber realizes that one of his customers was his torturer when he was a political prisoner.